Pictured from left: Lydia Knutsen and Chas McCool, Wendy’s High School Heisman State Finalists. 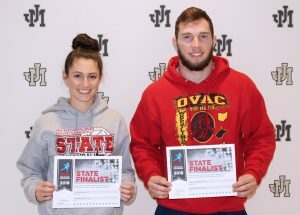 Wendy’s announced Thursday that John Marshall High School seniors Lydia Knutsen and Chas McCool are Wendy’s High School Heisman State Finalists. From a total applicant pool of nearly 42,000 high school scholar-athletes graduating with the class of 2019, 967 students have been named State Finalists in Wendy’s annual scholarship competition. State Finalists will continue to compete for the chance to become State Winners, National Finalists or National Winners. The State Winners will be announced on Wednesday, November 7 with National Finalists being named on Thursday, November 8 and National Winners will be published on Friday, November 9, 2018. State Winners receive a $500 college scholarship, National Finalists receive a $1,000 college scholarship and the male and female National Winners receive a $5,000 college scholarship and trip to New York City to attend the Heisman Trophy Trust’s annual college Heisman award broadcast on Saturday, December 8, 2018. Like the Heisman Memorial Trophy, Wendy’s believes in the pursuit of athletic and academic excellence with integrity. Since 1994, Wendy’s and the Heisman Trophy Trust have been running the same play to perfection: honoring more than 600,000 of the nation’s most esteemed students. The partnership succeeds because of a shared common set of values wherein going above and beyond is the norm. Wendy’s wants to honor students who do the same and profile their stories of perseverance to inspire the tomorrow’s senior class.